Series 9 Wet/Dry Electric Shaver Silver plus Clean&Charge Station & Travel Case is rated 4.6 out of 5 by 143. Rated 5 out of 5 by Ambi from Best Shaver EVER! I have been using electric shavers since 1981 and this Braun Series 9 Wet/Dry shaver is THE BEST!! It is the quietest one I have used. The shaving is a breeze and very very smooth. Cleaning is so easy and NO mess at all. I was a bit worried about not being able to charge and use at the same time but that is no problem at all as it has more than enough juice for a number of shaves and the time to recharge is very short. The price looks a bit steep but one use and you will agree (like me) that it is worth it. My son also uses electric shavers and after testing it, has decided to buy the same.Highly recommended for EAZY BREEZY SMOOTH Shave. Rated 5 out of 5 by VJ_69 from Leaves the Philips Series 9 for dead! I recently changed from the Philips Series 9 to the Braun Series 9. What an improvement! Yes it is a new shaver but so far it is so much of not only a closer shave but a faster shave. The Philips used to take so long to shave and never really got close on my coarse black stubble. If I even left it a day extra it was next to useless. Not so with this beauty! 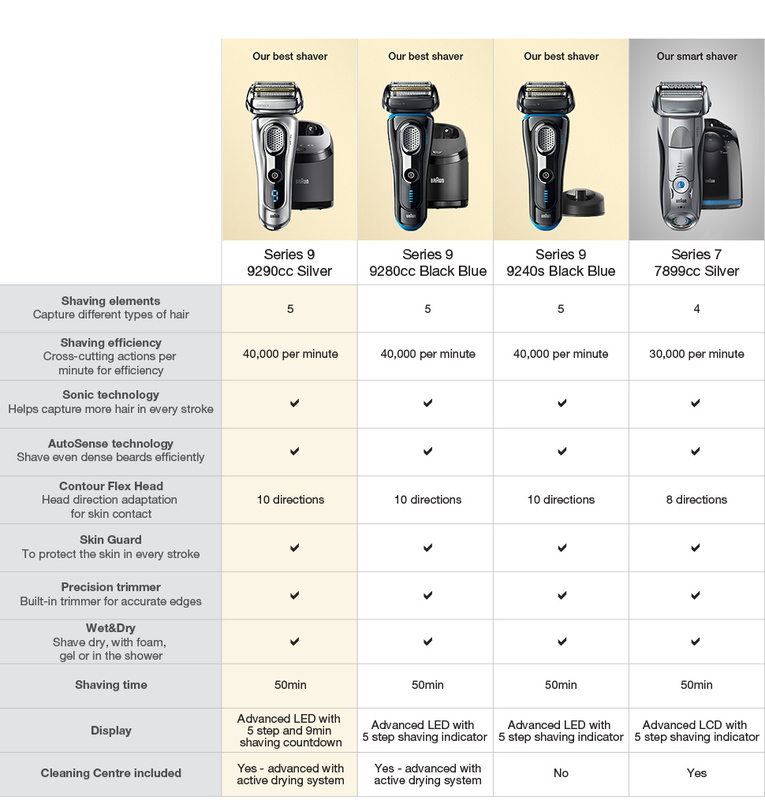 It not only shaves closer and faster but looks great even if a little bulky. Not the cheapest of upgrades but got a good deal on it to soften the pain and came with the great clean and charge station. Only downside is the noise of the cleaning station. Highly recommended if you can afford it. Rated 4 out of 5 by Russ from Good but not great Bought this a couple of weeks ago thinking it would be better than my previous Braun Series 7. I do not think so. The design has changed, so the trimmer is not as accessible. The razor is quieter and does not sound like it is working as hard. Still gives a great shave. Not sure if it is better than the series 7. It plugs in differently and does not have a curly cord. The recharge station socket is in an awkward place and the fluid goes in from the back instead of the front. The numbers shown in the pictures have not appeared on my new razor just blue horizontal lines, - I was expecting a much more intelligent razor for the price. Rated 5 out of 5 by Josh from The only move to Electric After years of loving safety razors religiously I thought I would try electric shavers once more. Over the 20years of shaving I have always tried them with hatred as they ripped my face off. With the great reviews and 60 day money back guarantee I thought I would have another go. Well I could not believe how well it shaved. Not as good as a cut throat or safety blade but very close with 80% less fuss every morning. As a everyday shaver I am converted. I will always use my safety blade but now I can enjoy it for special occasions. This series 9 now takes pride of place next to the sink for everyday use The cleaning station is fantastic too. So easy in a fast morning routine. Rated 3 out of 5 by dhenbery from Great Shaver But... I've been using this razor for many years and have found it to be one of the best shaves... And I have a tough beard! The problem I found is with the cleaning station. After about 6 months so it breaks down. It seems the water can't drain back into the reservoir so your cartridges use only last a few days. You cannot buy the cleaning station separate so it means you have to replace the whole razor. Likely mine had been within the warranty but is still a hassle going through the process of replacing the whole razor as the franchise tends to blame Braun. I'm going to try the new Braun9 dry razor to eliminate this problem. Because this is a big problem I'm undergoing to rate the razor 3 star. Rated 5 out of 5 by sam7 from Great shaver and perfect for a close shave When you first open up the Braun Series 9 shaver you can tell that this is extremely high quality. I am a very active/fit person and have been frustrated in the past with trying to get a close shave without any skin irritation. I was recommended this by a friend and have never looked back since using this for the first time. The charging station which also cleaners the shaver after use is really handy and means that it is so simple to charge and clean (just pop it on the clean & charge station and that's it). I travel often and so the travel case is something that I tend to use pretty often. Recommended for any man who wants a close shave without having to put up with any annoying shaving cuts or rash. Rated 5 out of 5 by Jojo from The Best Razor I bought this razor for my partner because he had been using disposable razors and shaving cream. He always was always ending up with severe irritation and a rash that would last until he was due to shave again. Oh and always cutting himself!!! He tried the Brain Series 9 Razor dry, with no shaving cream, and it was getting a closer shave than the disposable razors. His skin was so incredibly soft and there wasn’t even a hint of redness or irritation. The cleaning station is amazing as well, it gets every tiny piece of hair out of the razor with no effort at all. It is definitely worth the price, especially since the blades last 18 months. I couldn’t recommend this product highly enough! !